For the record, if Intel's tepid integrated graphics performance in 3D games is anything to go by, not having onboard video ports really isn't much of a loss. Back to the question of LucidLogix's Virtu driver and the Gigabyte GA-Z68X-UD5-B3 motherboard. Virtu does not work on the Gigabyte GA-Z68X-UD5-B3 motherboard because this particular board doesn't have any VGA/DVI/HDMI/DP video outputs. Thus, the computer doesn't see the Intel HD3000/2000 graphics and consequently the Virtu software will not install because only one GPU is detected. This is the error it throws up when installing Virtu v1.1.101.16713. For the sake of argument, if you install LucidLogix Virtu on an Intel Z68 system that does have onboard video ports and then swap hard drives, Virtu will refuse to load up on the GA-Z68X-UD5-B3 motherboard because it doesn't detect integrated Intel graphics. In short, Virtu isn't available to the Gigabyte GA-Z68X-UD5-B3 motherboard. Gigabyte designed this platform for enthusiasts who its research says will never use Virtu + Intel IGP in place of pure performance oriented discreet videocards. Taking this approach to the Intel Z68 removes one of the more novel features of the chipset; the ability to use the LucidLogix Virtu driver to virtualize the integrated graphics core for transcoding acceleration. Of course if you don't care about transcoding, this is entirely a moot point. Moving along, PCSTATS will be testing Intel Smart Response Technology, a rather nifty feature for users still clinging to mechanical hard drives. In addition to major changes like Intel FDI, the Intel Z68 continues support for SATA 6Gb/s devices and slowly increases the number of USB 2.0 ports. Still no USB 3.0 though... The final notable addition to the Intel Z68 is Intel Smart Response Technology. PCSTATS is going to discuss Intel SRT in detail in the next section since there's a lot to go over. If you've been thinking about installing your operating system onto a Solid State Drive to speed things up, you're really going to really like this! Of all the Intel Z68 chipset features the most interesting is a new data caching tool called Intel Smart Response Technology, or 'Intel SRT' for short. In plain language, what Intel SRT does is bring about like-SSD performance to operating systems and applications installed on traditional mechanical SATA hard drives (HDD). Intel SRT works by storing frequently accessed hard drive I/O data blocks on a dedicated SSD drive so that Windows can access data immediately from the SSD cache. 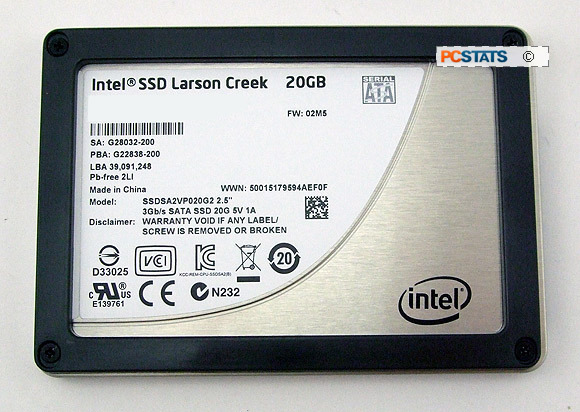 The system is compatible with mSATA or standard SATA SSD devices, for PCSTATS tests we chose an Intel Larson Creek 311 SSD with a capacity of 20GB. 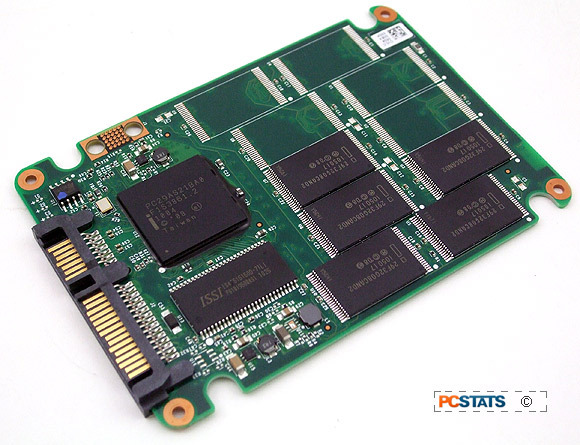 The Intel SSDSA2VP020G2 is a 2.5" formfactor solid state drive made with 34nm SLC 'Compute NAND' memory. Intel SRT cannot be applied to systems installed on an SSD already and it really only works for the boot disk/volume. Furthermore, applying Intel SRT to accelerate a secondary non-OS volume doesn't show much impact either. For an in-depth look at Intel SRT please see this PCSTATS article. Intel's Smart Response Technology goes beyond just storing frequently accessed data on a quick SSD and works in conjunction with Intel's Rapid Storage Technology (Intel's built in RAID software) to apply a sort of RAID 0 rule to the data cached across the SSD and HDD. Although both Intel P67 and H67 chipsets use Intel Rapid Storage Technology, neither supports this new SSD caching tool. Why would you need Intel Smart Response Technology? Well, for those of us that cannot afford high capacity Solid State Drives or for whom SSD's haven't reached sufficient storage capacity, Intel SRT is an economical way to speed up application load times and generally make recurring application data much snappier. As you'll see in the benchmarks on the next page, for about $100 bucks you can add a 20GB Intel 311 SSD to a motherboard like the Gigabyte GA-Z68X-UD5-B3, configure SRT and immediately enjoy a very real boost in speed to applications installed on a regular old HDD.